The Rattling Spooky Shad is another version of Bill Heugel's Spooky Shad which has been so effective on Toledo Bend Lake in East Texas. This version, as the name implies, has a rattle as part of the body. 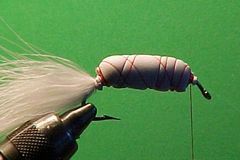 The rattle combines sound with motion to make a more perfect floating fly. Much has been written about the role sound plays in a flies effectiveness. 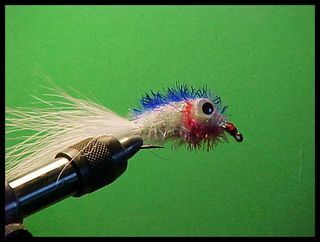 I was first introduced to a fly with a rattle as part of the dressing by Captain Chris Phillips. That fly was called the Rattle Rouser. On a recent trip to Sabine Lake with Captain Mike Rector I fished the Rattle Rouser again. I had a great day catching specs and reds on that fly. Captain Rector tried it on a later trip and also had great success with it. He called it "deadly". 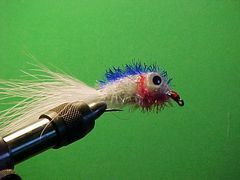 Later I did some web surfing and discovered that a lot of tiers are making flies with rattles as part of the dressing. Here are just a few of the fly patterns, with rattles, that I found on the web. In the row of flies shown below the third fly from the left is the Rattle Rouser, the fly that took all of those Reds and Specs on Lake Sabine. 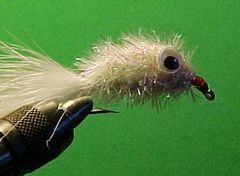 The first fly in the row of photos is called the the Rattle Eye Minnow and it uses an eye type rattle that is attached to the fly in the same way that lead barbell eyes are attached. As I continued to surf the web my interest peaked and I was convinced that I wanted to put a rattle on one of my favorite designs called the Spooky Shad. But first I had to decide which type of rattle to use. I discovered that there are basically three types of rattles. The Eye Rattle, the Tube Rattle and the Worm Rattle. All three styles can be purchased from various fly tying materials houses. The Worm Rattle is also available at outdoor supermarkets like Bass Pro Shops Outdoor World. The photo at the left contains tube rattles that are rounded at both ends.The photo at the right contains Eye Rattles. Worm Rattles, which are not shown here, are tublular in nature with a flat rear-end and a pointed front-end. The point allows the rattle to be easily inserted into one of those rubber worms that the bait casters use so effectively. 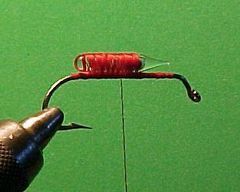 If you choose to use a worm rattle be sure to mount it on the hook's shank with the point facing the hook's eye. 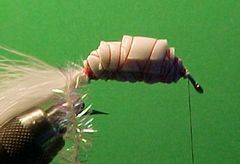 Attaching a rattle to the fly can be a pretty crude operation and a little super glue can help hold it in place. Fish the Rattling Spooky Shad just like you would fish the Spooky Shad. However, because of the rattle, the Rattling Spooky Shad is a heavier fly and it probably will require an eight-weight rod. You should also open up the loop more than you normally would. Even though it's heavier than the Spooky Shad it floats well and has nice action on the retrieve. It might be a good idea to check out the Tying Notes and the Angling Tips for the Spooky Shad before you attempt to tie and fish the Rattling Spooky Shad. Here is the link to the Spooky Shad. Clamp the hook in the vice and lay down a substantial thread base from slightly behind the hook's eye back to the hook's bend. You can use either a Eagle Claw 410 Jig Hook or a Mustad 34001 saltwater hook. If you use the Mustad hook you will have to bend the eye down. 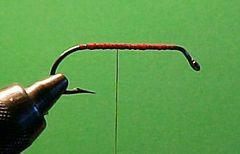 The hook in the tying sequence is the Eagle Claw Jig Hook in size 2. Tie on a 3mm worm rattle with the point facing the hook's eye. 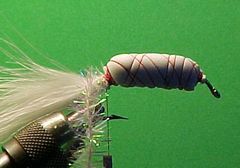 The rattle should be aligned on the shank so that there is enough room to add the marabou tail in the next step. First, place a line of super glue on top of the thread wraps in the area where the rattle will be. 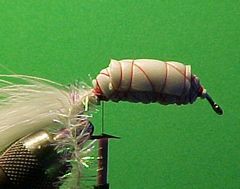 Then attach the rattle directly on top of the hook's shank with an even layer of thread wraps. 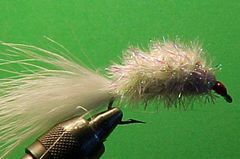 Now add the marabou tail to the rear of the hook. 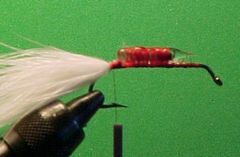 The marabou should be about the length of the hook or a bit longer. Cut a piece of foam foam, that has adhesive on one side, that is slightly more than 3/8" wide and slightly shorter than the hook's shank. You want to leave room at the rear and front of the fly to tie in and tie down the Estaz outer body. Bind down the foam tightly at the front and rear and use moderate wraps of thread between those two points. 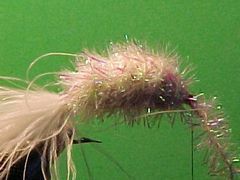 Tie in a piece of Estaz about six-inches long at the base of the marabou tail. Now, tie in a second piece of foam. This time use picture hanging foam which is available at your local Wal-Mart or most hardware stores. This foam is sticky on both sides. This piece of foam should be slightly shorter than the first piece. When wrapping the foam with thread you can do some shaping at the front and the back to give the body the proper look but don't put to much pressure on the thread when you are moving the thread between the front and the back. You don't want to depress the foam body because it won't float as well. Finally, cut a slightly smaller piece of picture hanging foam for the top of the fly. Tie it on in the same way that you tied the other pieces of foam. Wrap the Estaz forward and tie off behind the eye. Be sure that you leave enough room to form a thread head. Remove any excess Estaz. Form a neat thread head and tie off the thread with a couple of half-hitches or a whip finish. Coat the thread head with cement. Glue on the doll eyes. Put a dab of Household Goop on the back of each eye and press them firmly to the Estaz. Goop can be purchased at any hardware store or home center. Color the Estaz body as show with your choice of permenant markers and your Rattling Spooky Shad is ready to fish.